NOTE: “Empty”, “Low Ink”, “Out of Ink“, “? Marks“, “Counterfeit” and “Non-Genuine Cartridge” alerts are COMPLETELY NORMAL for all HP 63 & HP 63XL black and color ink cartridges which have been refilled! – Information Alerts. 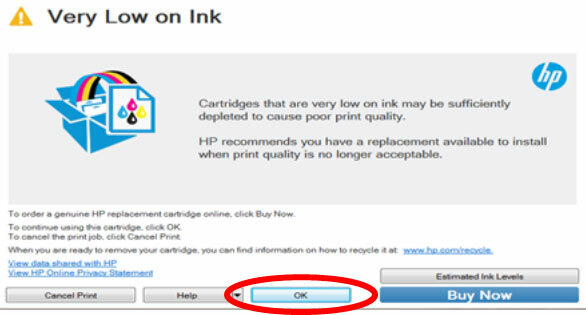 When a refilled HP 63 or HP 63XL ink cartridge is installed it is normal to receive alerts such as ‘non-genuine cartridge’ or ‘used color/black cartridge’. These may be bypassed by selecting ‘Dismiss’, ‘Ok’, or ‘Continue’. – Nuisance Messages. After a refilled HP 63 or HP 63XL ink cartridge is detected it is normal to receive alerts such as ‘low on ink’, ‘counterfeit’, ‘used’, ‘fraud’, ‘refilled’, or ‘depleted’ cartridge. These my be bypassed by selecting ‘Dismiss’, ‘Ok’, or ‘Continue’. If a “Non-HP Cartridge(s)” or “Very Low on Ink”, or similar message cannot be bypassed then the cartridge may be suffering from marginal internal electrical performance and may need to be replaced with a new one. It is first suggested to remove and thoroughly clean cartridges electrical contacts & printer flex cable contacts and retest (refer to Printer Maintenance). If the problem persists then return cartridge to your refiller for analysis. A message that says “Cartridge Missing or Not Detected”, “Replace Cartridge”, “Incompatible Print Cartridge”, “Black/Color Cartridge Problem”, or similar, on your monitor or on the printer display. – Severe Errors. 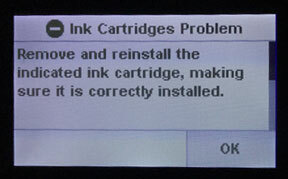 When a HP 63 or HP 63XL ink cartridge has poor connectivity (between contacts and flex cable inside printer) or is suffering from marginal internal micro-electrical performance, you may observe error messages such as ‘replace cartridge’, ‘incompatible cartridges’, ‘print cartridges error’, ‘cartridge missing or not detected’, etc. In addition, the power light may be blinking while the error message is displayed. In some cases, errors can be cleared by removing and cleaning the ink cartridges and printer flex cable contacts. If not, then it is suggested to run the cartridge health diagnostics (‘tap 41’) check or perform a cartridge error bypass (available on select printer models) to confirm that the ink cartridge is damaged. – Cartridge Electrical Failures. Severe HP 63 or 63XL cartridge errors are primarily caused by an electrical breakdown at the cartridge’s nozzle plate. Ink penetration or corrosion into the nozzle plate will cause a failure of the tiny micro-electronics resulting in a variety of different error messages being displayed. – Cartridge Diagnostics. The cartridge’s electrical health can be verified by running the ‘Tap 41’ diagnostics at the printer’s control panel (NOTE: not available on all printer models). 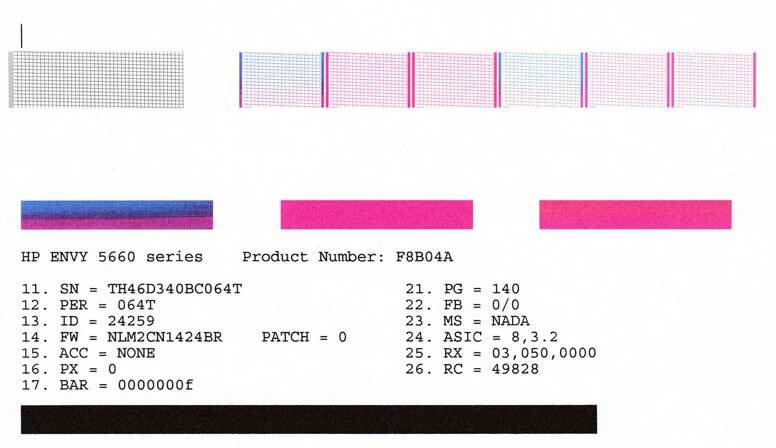 If the ‘Tap 41’ or ‘Tap 10’ service test print is successful this only means the printer is functional, one (or both) of the ink cartridges may still be electrically damaged and may not support/allow NORMAL print operations to proceed. Turn printer Power ON; wait 15 seconds for printer to fully energize. Release the Power button. The ‘Tap 41’ test report should print within 30 seconds. A.2. At ‘Support’ menu, select the upper right button until the ‘Reports Menu’ is visible. Select OK.
Press upper right button until ‘print mech button tap’ menu is displayed. A.3. Press OK, the ‘code = 0’ menu should be displayed. A.4. Use arrows keys to change value to ‘code = 41′ (i.e. press and hold right arrow key). When ‘code = 41′, select ‘OK’. A.5. The diagnostic ‘tap 41’ service test report will print. In the upper/top portion of the service test print, ‘Current Error‘ should state ‘None‘ for a properly functioning ink cartridge. B.1. Unplug printer’s power cord. B.2. Press and hold power button, plug printer power cord in, wait a few seconds until the white light on front of unit is displayed/illuminated, release power button. B.4.The service menu will be displayed. B.5. At ‘Support’ menu, select the upper right button until the ‘Reports Menu’ is visible. Select OK.
B.6. Press OK, the ‘code = 0’ menu should be displayed. B.7. Use arrows keys to change value to ‘code = 41′ (i.e. press and hold right arrow key). When ‘code = 41′, select ‘OK’. B.8. The diagnostic ‘tap 41’ service test report will print. In the upper/top portion of the service test print, ‘Current Error‘ should state ‘None‘ for a properly functioning ink cartridge. In the lower portion of the Tap 41 test print, the Black/Color columns should not have any values other than zero (0) displayed. If a value other than zero (0) is displayed in the areas indicated then the cartridge is likely permanently electrically damaged and may need to be replaced with a brand new cartridge. NOTE: The Tap 10 self-test print [i.e. change value to ‘code = 41′ (i.e. press and hold right arrow key). When ‘code = 41′, select ‘OK’], which prints a range of black and color test patterns, may also be initiated via ‘code = 10’ (i.e. using the procedure above). Evaluate printed nozzle stair-step patterns for missing ‘horizontal’ lines. If more than 10% of the horizontal lines are missing, for any given grid, this typically means the respective ink cartridge (i.e. either black or tri-color) is electrically degraded and may not support normal printing. NOTE 1: Replacing the ink cartridge with a brand new HP original ink cartridge is the best way to verify cartridge/printer performance.